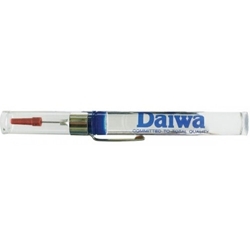 Daiwa's Reel Oiler is a handy needle nose, one drop lube for any of your reels. This oiler keeps reels in tip-top shape and it has a convenient clip making it easy to carry it in your pocket. Daiwa's precision reel oiler is designed for convenient lubrication of your reels to keep them corrosion free and running smoothly season after season.